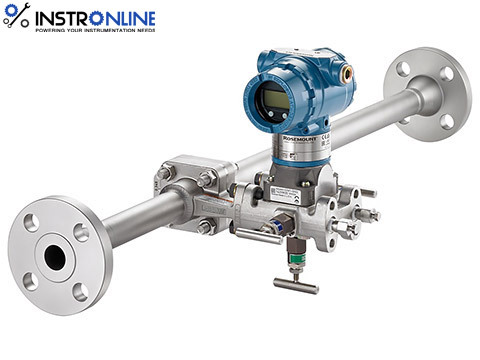 An Orifice Meter is basically a type of flow meter used to measure the rate of flow of Liquid or Gas, especially Steam, using the Differential Pressure Measurement principle. It is mainly used for robust applications as it is known for its durability and is very economical. As the name implies, it consists of an Orifice Plate which is the basic element of the instrument. When this Orifice Plate is placed in a line, a differential pressure is developed across the Orifice Plate. This pressure drop is linear and is in direct proportion to the flow-rate of the liquid or gas. Since there is a drop in pressure, just like Turbine Flow meter, hence it is used where a drop in pressure or head loss is permissible. An orifice meter is a conduit and a restriction to create a pressure drop. A nozzle, venturi or thin sharp edged orifice can be used as the flow restriction. In order to use any of these devices for measurement it is necessary to empirically calibrate them. That is, pass a known volume through the meter and note the reading in order to provide a standard for measuring other quantities. As the fluid approaches the orifice the pressure increases slightly and then drops suddenly as the orifice is passed. It continues to drop until the “vena contracta” is reached and then gradually increases until at approximately 5 to 8 diameters downstream a maximum pressure point is reached that will be lower than the pressure upstream of the orifice. The decrease in pressure as the fluid passes thru the orifice is a result of the increased velocity of the gas passing thru the reduced area of the orifice. When the velocity decreases as the fluid leaves the orifice the pressure increases and tends to return to its original level. All of the pressure loss is not recovered because of friction and turbulence losses in the stream. The pressure drop across the orifice ( ΔP in Fig.) increases when the rate of flow increases. When there is no flow there is no differential. The differential pressure is proportional to the square of the velocity, it therefore follows that if all other factors remain constant, then the differential is proportional to the square of the rate of flow. A linearly extending section of the same diameter as the inlet pipe for an end connection for an incoming flow connection. Here we measure the inlet pressure of the fluid / steam / gas. An Orifice Plate is inserted in between the Inlet and Outlet Sections to create a pressure drop and thus measure the flow. A linearly extending section similar to the Inlet section. Here also the diameter is the same as that of the outlet pipe for an end connection for an outgoing flow. Here we measure the Pressure of the media at this discharge. As shown in the adjacent diagram, a gasket is used to seal the space between the Orifice Plate and the Flange surface, prevent leakage. Sections 1 & 2 of the Orifice meter, are provided with an opening for attaching a differential pressure sensor (u-tube manometer,differential pressure indicator). The Orifice plates in the Orifice meter, in general, are made up of stainless steel of varying grades. *Beta Ratio(β): It is the ratio of orifice bore diameter (d) to the pipe inside diameter (D). It has a hole which is a semi circle or a segment of circle. The diameter is customarily 98% of the diameter of the pipe. This type of orifice plate is used for flow such as crude oil, high viscosity syrups or slurries etc. It is conceivably used when the line Reynolds Numbers range from 100,000 or above or in between to 3,000 to 5,000 with a accuracy coefficient of roughly 0.5%. -The fluid flows inside the Inlet section of the Venturi meter having a pressure P1. -As the fluid proceeds further into the Converging section, its pressure reduces gradually and it finally reaches a value of P2 at the end of the Converging section and enter the Cylindrical section. -The differential pressure sensor connected between the Inlet and the and the Cylindrical Throat section of the Venturi meter displays the difference in pressure (P1-P2). This difference in pressure is in direct proportion to the flow rate of the liquid flowing through the Venturi meter. -Further the fluid passed through the Diverging recovery cone section and the velocity reduces thereby it regains its pressures. Designing a lesser angle of the Diverging recovery section, helps more in regaining the kinetic energy of the liquid. -The Orifice meter is very cheap as compared to other types of flow meters. -Operational response can be designed with perfection. -Installation direction possibilities: Vertical / Horizontal / Inclined. -The minimum pressure that can be achieved for reading the flow is sometimes difficult to achieve due to limitations in the vena-contracta length for an Orifice Plate. -Unlike Venturi meter, downstream pressure cannot be recovered in Orifice Meters. Overall head loss is around 40% to 90% of the differential pressure . -Flow straighteners are required at the inlet and the outlet to attain streamline flow thereby increasing the cost and space for installation. -Orifice Plate can get easily corroded with time thereby entails an error. -Discharge Co-efficient obtained is low.